"Resurrected From The Grave – Demo Collection"contains theEntrails demos "Reborn" and "Human Decay," features 18 total tracks, and will be released as a Digi-CD as well as on vinyl in Europe. In North American, the album will be available on CD and digitally. Back in 2009, when the two Entrails demos were re-recorded and unleashed for the very first time, they were self released and homemade on CD-R and limited to 50 copies each. Back then, it had been decided that they would need to be re-pressed at some point in the future. Nearly five years after the first demo "Reborn"was unleashed - it's finally time to release them officially via Metal Blade Records. 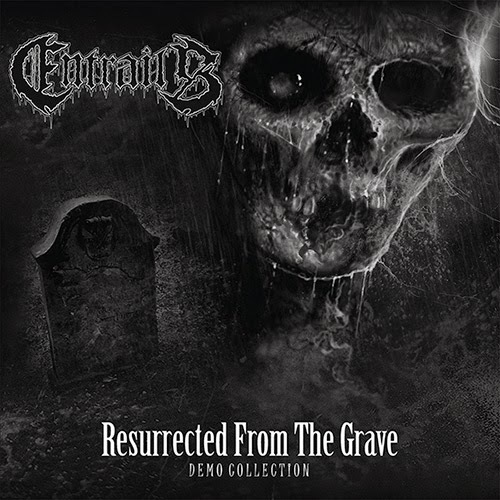 Entrails guitarist Jimmy Lundqvist comments: "It feels great to finally do something serious with the two demos from 2009, "Reborn" and "Human Decay." After multiple requests from fans asking about the demos I had to release the brakes on this, now or never. While we are working on the upcoming new Entrails full-length, we feel better to do this release now which gives a bit more time for upcoming shows and the new album!" The demo material is based on the ideas Entrails first worked on back in the 90's in studio/rehearsal. For various reasons, they were never released back then and a few years later the band fell apart. Jimmy Lundqvist continued to write songs, riffs, and made sure to save them all on tape. Fifteen years passed before Jimmy decided to record these ancient relics with modern tools, computers, and some help from his brother in crime, Jocke Svensson on vocals. The first demo "Reborn" was recorded in early 2009 and the follow-up "Human Decay"shortly after in the summer of 2009. Entrailsmost recent full-length album, "Raging Death," was released in May of 2013 on Metal Blade Records and is available in stores and on-line now. For more information, to listen to music, read about the band, and order, visit the band's page at metalblade.com. Entrails, Swedish death metal comparable to Dismember, release their two demos “Reborn” and “Human Decay” on one disc for the first time. When many people (me included) think demo, their mind harkens back to the 90’s, cassette tapes, local 8 track studios etc etc. That preconception is not appropriate here! What we actually get is two demos recorded within months of each other in 2009- modern technology renders the results very listenable and, indeed, better than some band's actual albums proper! The Reborn demo kicks things off- you get 18 tracks for your money, including spooky intro tracks and a whole lot of death metal. The material is well thought out and played. To be fair, it should be, as much of the material dates back to the early 90's when Entrails first walked the earth. Resurrected indeed, then, are these death metal adventures from the genre's peak. The songs are fast and nasty- chainsaw guitars, rattling drums and real death vocals predominate. The like of ‘The Morgue’ are as speedy as they are stomping and the band combines the best of the geographical genre's traits to make memorable material. The “Human Decay” demo has a slightly more expansive sound which I prefer on comparing the two, but let's face it: these are demos and as such the sound of both is just fine. The likes of ‘Blood Red’ and ‘Evil Terror’ slay as well as anything in the band's official discography and that is credit to them. The production suits the material well- loud, fast and raw. As an introduction to Entrails this works very well indeed- it shows their beginnings and the launching pad from which they sprang. As a collector's piece it works equally well- for avid completists it is essential, I presume. The band's anthem ‘Entrails’ best sums up the band here- fast and slow, melodic in places, but always death metal to the max: Entrails are one of the best in the genre. This demo collection proves it. Their studio albums proper just cement this fact. Raging death metal of the highest order.